The new Four Channel Input module takes four line-level mono signals, each with their own solo, volume and pan controls and provides options to route them into either the X-Rack Master Bus or Record Bus. 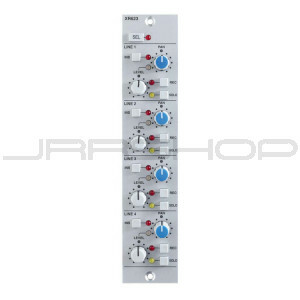 Each input also has its own insert point to integrate other X-Rack modules (or outboard units), that can be switched into the signal path. Combining multiple Four Channel Input modules, a 28 input, dual stereo SuperAnalogue mix bus can be created in a single X-Rack chassis.